400 years ago, the Roman Inquisition condemned the Copernican theory that postulated that the Earth revolved around the Sun. It was a key event that to a great extent divided Europe into two different realities, similarly to what had happened a century before with the Protestant Reformation. On February 24, 1616, the Roman Inquisition approved two proposals that condemned the heliocentric theory developed by Nicolaus Copernicus in the mid-16th century. They denied the Sun’s centrality (implicitly that the Earth orbited around the Sun) and described this belief as heretical and absurd from the philosophical point of view. The next day they reprimanded Galileo Galilei, one of the continent’s most reputed scientists, and they urged him to abandon the Copernican system. How was that point reached and what did it really mean? Figure 1: Diagram by Nicholas de Fer, published in 1699, with the cosmologies of Ptolemy, Copernicus and Brahe. Image: Courtesy of the U.S. Library of Congress. In 1543, on his deathbed, Copernicus published “De Revolutionibus Orbium Coelestium (On the revolutions of heavenly bodies), a highly technical text which proposed that it was the Earth that revolved around the Sun (actually, around a point very near the Sun). This meant that the stars were incredibly distant and altered the geocentric cosmological system that had prevailed for over 2,000 years, based on Aristotle’s theories. Curiously, part of the Catholic hierarchy took a positive view of the work, perhaps because the new system made it easier to calculate the positions of the Sun, the Moon and the planets, and represented an advantage when it came to determining the time of Easter, which occurs after the first full Moon following the passage of the Sun through the spring equinox (the start of the season). However, initially some prominent figures of the Reformation movement flatly rejected this ground-breaking view of cosmos. In any event, the heliocentric theory was limited to academic circles and its effect was quite reduced. Cover of the first edition of “Sidereus Nuncius”, 1610. The “Space Messenger” is a short leaflet in Latin published by Galileo that broke forever the geocentric and Aristotelian view of the universe. Picture of a copy kept at the Crawford Library of the Royal Observatory, Edinburgh. 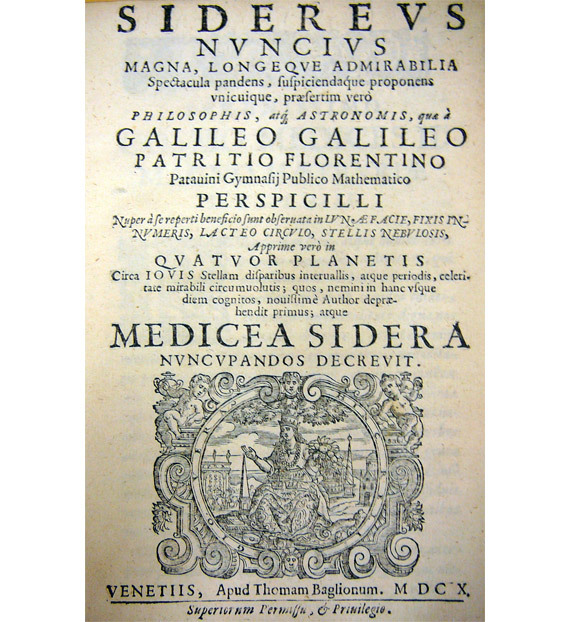 Decades later, and after the invention of the telescope, Galileo published a small work that would revolutionize the scientific and philosophical scene: “Sidereus Nuncius” (Space Messenger). It announced the discovery of mountains on the Moon and numerous stars invisible to the naked eye that made up the so-called Milky Way. But most importantly, it announced the existence of four satellites that orbited around Jupiter, something that broke one of the essential premises of geocentrism: that all heavenly bodies revolved around our planet. To get an idea of the impact that this new window had, just think about the recent detection of gravitational waves, which also open an original door for analyzing phenomena invisible up to that time. There is one essential difference: while these were predicted brilliantly by Albert Einstein, the new phenomena that Galileo saw for the first time were unexpected and made a clear break with the past. Thus, Kepler and Galileo, despite their different religious confessions (one Protestant and the other Catholic), found a common ground: scientific truth. However, the surprise in Europe following these discoveries was not without controversies and ended up causing a collision with the intelligentsia and the church hierarchy. For this reason, the commission of theologians advising the Roman Inquisition criticized the heliocentric theory postulated by Nicolaus Copernicus and reasserted the validity of the Earth’s immobility. The process was actually somewhat more complicated. It began on February 19 with the proposed censure by a commission of experts, which did not include any astronomers. It continued with a meeting of the Sacred Congregation of the Holy Office, where Galileo was reprimanded by an order of Pope Paul V, which was executed the next day by Cardinal Bellarmino (who also took part in the proceedings involving Giordano Bruno, who was burned at the stake), when he was ordered to abandon the opinion that the Earth moved. On March 1, the Index Congregation banned a number of books related to heliocentrism and their validity from a theological point of view, and the work by Nicolaus Copernicus was suspended until it was “corrected”. We should remember that the heliocentric theory and its accompanying mathematical model were essential for accurately and easily calculating planetary motions, and was related to the reform of the calendar in 1582, so it was extremely difficult to ban it completely. The decree was published on May 5. Getting round the reprimand, Galileo continued with his fight to defend heliocentrism with the publication of “Il saggiatore” in 1623 and “Dialogue Concerning the Two Chief World Systems” nine years later. An expert in irony, he would use his pen mercilessly against his opponents and the defenders of geocentrism, making many enemies from several classes. With this last essay he clashed head-on with the Inquisition, despite the fact that the text had received its imprimatur or printing permission. In 1633, after a real trial that did not follow the legal procedure of the Inquisition and where he was threatened with torture, he was forced to abjure his beliefs. Thanks to influential friends, he was only put under house arrest in his home in Florence, which he would only be allowed to leave on very few occasions. Although Galileo did not whisper “Eppur si muove” (And yet it moves) while he abjured, the Earth’s motion would be tested experimentally in 1729 by James Bradley using an effect known as “aberration of light”. Even so, Copernicus’ heliocentric work would remain in the Roman index of banned books, the infamous “Index Librorum Prohibitorum et Expurgatorum”, until 1835. Despite the prosecution, his struggle for truth continued and four years later he published “Discourses and Mathematical Demonstrations Relating to Two New Sciences”, on which he based mechanical physics and which was the coup de grâce that completely dismantled the Aristotelian view. Cover and two pages of the “Index librorum prohibitorum”, in its 1681 version. This is the feared index of books banned by the Roman Inquisition, in a 1704 print. The titles of the works by Copernicus “De revolutionibus” and Galileo “Dialogo sopra i due massimi sistemi del mondo” can be seen. Courtesy of ETH-Bibliothek Zürich (Rar 2719). Thus, the initial proceedings against heliocentrism opened a gap between the Catholic hierarchy, which until then had been deeply involved in the dissemination of knowledge, and scientific development. And almost simultaneously, a model took root in the Protestant countries in which free speculation and expanding education even to the most disadvantaged sectors of society were essential, thus promoting scientific and economic development, two closely related activities. A North-South dichotomy that even today has not been completely closed. We now honor freedom of thought and the quest for truth, and also the life and works of many scientists and intellectuals who even today are paying an extraordinary price for defending these rights. In the Middle East we are increasingly witnessing the destruction of the cultural heritage that belongs to all while those who dare to go beyond the limits of orthodoxy are silenced using barbaric methods. But even in the West science and culture seem to be in a straightjacket, leaving no room for surprising speculation. Precisely in this centennial of Albert Einstein’s General Theory of Relativity we can ask ourselves if a genius like that, who worked in the darkness of a patent office, could emerge today, given the pressure of bureaucracy, which leads toward certain lines of knowledge considered useful, and the pressing demand for publishing in the academic world. Discrimination on grounds of sexual orientation or gender continues to be obvious, with lower wages for women or harder scientific university courses. Meanwhile, the citizens fall into a devastating conformism, devouring consumer technology without really understanding how things are made, and much less asking themselves the reason. Critical attitude, especially that which examines our own attitudes and beliefs, is conspicuous by its absence. So it is now time to reflect and also celebrate the well-being that this knowledge provides: a society that invests in education and research is a society that really believes in a future of free citizens who enjoy the same opportunities.